Here is the latest newsletter installment of an image and quote from the museum’s award-winning book Watershed Moments – A Pictorial History of Courtenay and District. 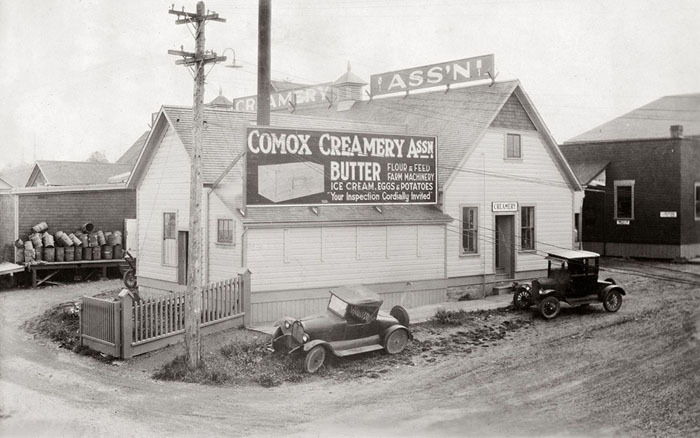 Photo credit: The Comox Co-operative Creamery building, 1927. CDM 986.73.3. Pages 84-85. Photo caption: “…the Creamery became a one-stop shop for dairy products, grains and farm supplies for Courtenay and the valley, and its milk, butter, cheese and ice cream were sold throughout British Columbia. By 1920, 2,700 cows were contributing to the co-op.” Page 86. Located in the beautiful Comox Valley on Vancouver Island, British Columbia. Be our guest to find out why the Comox Valley - past and present, is one of the most plentiful places on earth.